Hey, y'all! 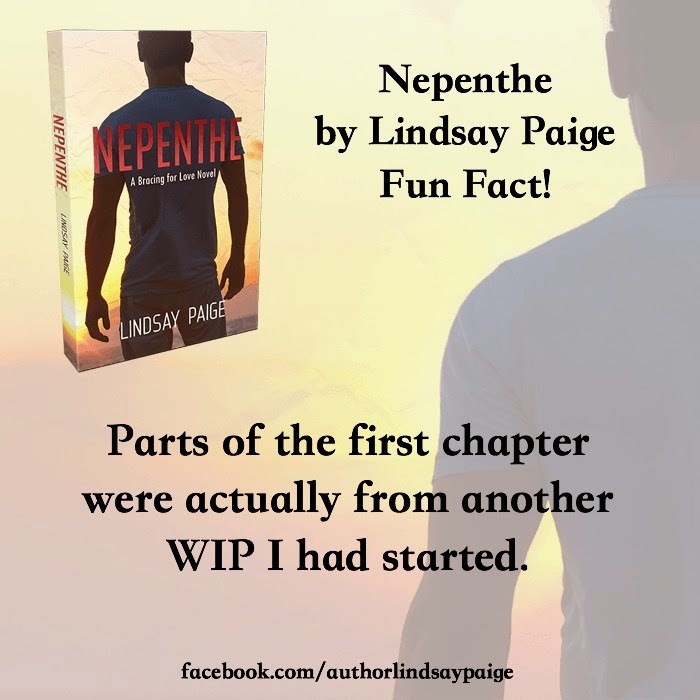 Finally, I've gotten all the Nepenthe fun facts done and ready to share. There are five in total and I'll be sharing one per day along with a little more detail about each fun fact. I have 30 WIPs saved and I'm only currently focusing on three. Some of these are two years old. I'll start and then stop, finding another story that is actually ready to be told, or one that is way better than what I started. Most of these will never see the light of day, but I keep them in case pieces of what has been written can work in another story. When I started writing Corey's book, I knew when along Bracing the Blue Line's timeline I wanted it to start. I first had to think what could happen, what sort of mindset he would need to be in, for his siblings to pay him a visit. I remembered the beginning of another story I started that would fit perfectly. After a little altering to better fit Corey and his story, I had the beginning of a first chapter. There you have it! That's our first fun fact. Come back tomorrow, same time, same place, for the next one! Check out this giveaway where you can enter to win ebooks from the Bracing for Love series!